What truck has eight mufflers that rotate that solves the ultimate exhaust question: “What does it sound like?” That would be MagnaFlow’s 1949 Chevrolet Truck. And yes, really it does have eight rotating mufflers that rotate to listen to different, exhaust sounds. 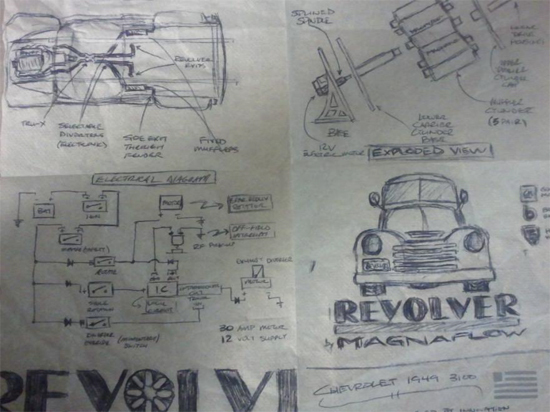 This napkin drawing shows the concept behind MagnaFlow’s Revolver Truck. The unique truck features eight different mufflers, so you can hear the differences. 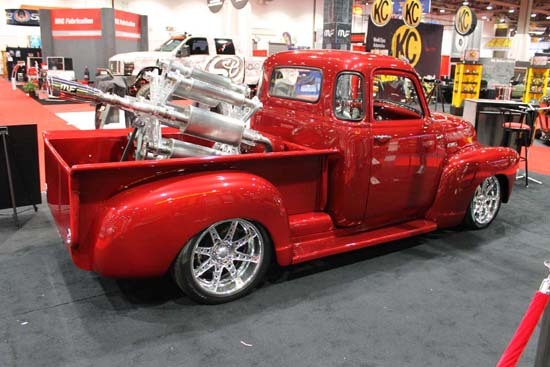 The MagnaFlow truck is set to appear at the 2012 SEMA Showin Las Vegas, NV. The story behind this truck is like a lot of great inventions. MagnaFlow’s Senior Manager, Richard Waitas sketched out a design on a back of a napkin while on a plane. Essentially, Waitas was stuck on the problem of how everyone interprets sounds differently. What may sound deep and raspy to one person isn’t that same for another. Now with the Revolver truck they can simply rotate in a new muffler to create a new exhaust sound. This could be the ultimate exhaust demo truck in the world. And it isn’t just a fancy muffler tester. It is built and meant to be driven. In fact, you could even take the revolving mechanism off and it still has an exhaust system allowing you to drive it up the street or on a track. Building the truck brought together the talents of legendary designer and MagnaFlow team member Chip Foose. After Waitas and Foose hammered out the design, they sought out the help of CW Restorations in Mason, Ohio. Besides the eight-muffler revolver mechanism, the old Chevy has a custom, fabricated bed, distinctly rounded fenders and exhaust tips blended into the taillights. That is quite the assortment of exhausts in the back of this 1949 Chevrolet 3100. The plans are for the truck to be on display at the 2012 SEMA Show in Las Vegas, NV. It would then travel the country going to different car shows. You can bet that MagnaFlow is hoping this project is a resounding success and it is able to actually let people listen to a “real-world” exhaust sound to determine the best sound for their ride. What do you think? Do you struggle with finding the right sound when picking out a new exhaust system? If so, this truck could be the answer to all of your exhaust sound questions. I have spent the last twenty-five minutes trying to find a vid w/ sound, no dice for me either? I thought it was weird to splash it on at the end of CCR w/o out a peep/roar! Bruce – Sorry, we didn’t get a chance to hear it at SEMA. I agree, what is Magnaflow thinking? How hard is it to upload a video?! And now it is May and still no video. Great teaser, but totally useless as a sales tool if you can’t see and hear it. Most of us muffler users don’t attend SEMA (where you couldn’t hear it either!) so it needs to be out in HiRes video where it CAN be seen and especially heard. Magnaflow, what are you thinking? Still waiting! When do we get to see/hear it run? Looks cool. You cant make it work? How hard can it be? i am reading this enormous educational postt here at my home. What is the name and size of the Foose wheels on this truck?